The train is currently open the 2nd & 4th weekends from 10:30- 3:30 until April 2009. The train passes through the forest. Kids enjoying the train. 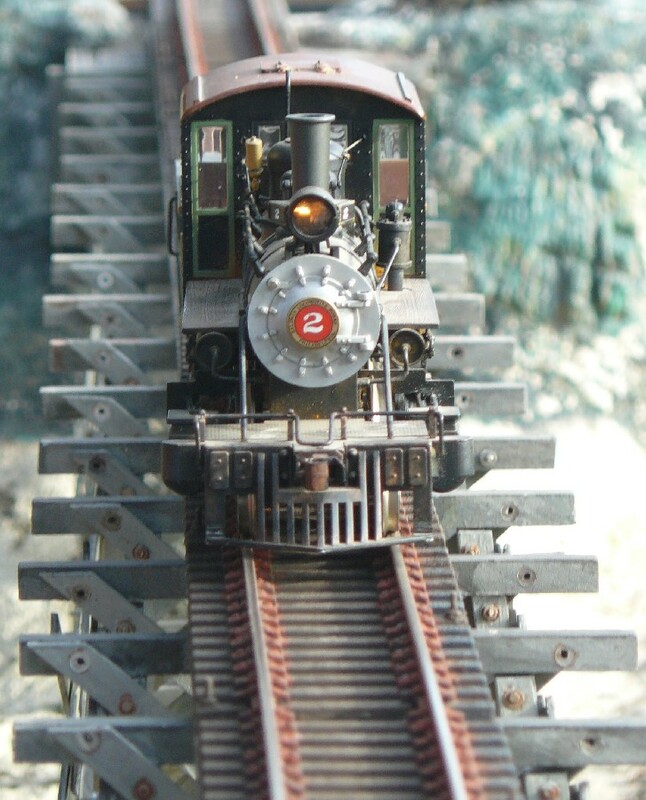 Under Way!The Mendocino Coast Model Railroad and Historical Society has just opened a large permanent model of Digger Creek & Northern Railroad. It is huge – with a little over 200 feet of track of main line – and it is UNIQUE! It is the first “living history” raised from the ground public model railway. Many garden railways (in fact most) model a period but few try to recreate scenes from “real life” even though they may be based on a locale or a railroad. For well over 100 years nearly every river and doghole port on the Mendocino Coast from Gualala in the south to Rockport to the north was the home of a redwood lumber mill and its railway. Alas, the whistles of the mills and the trains that brought the redwoods to the mills blow no more. They are all gone. The Digger Creek and Northern recreates those bygone days through dioramas based on real life scenes including a 16 foot long model of the Pudding Creek Trestle. The Digger Creek and Northern was built and paid for by the Mendocino Coast Model Railroad and Historical Society and donated to the Mendocino Coast Botanical Gardens. Digger Creek is maintained and operated by the Model Railroad Club. So, what’s so unique about that? ….. Well the “unique deal” is that ANYONE who is a member of the Botanical Gardens or who has paid for admission can run his/her/their train anytime they want. If you have a G Scale loco (electric or live steam) and a consist (if you have one you want to bring one) you can run it through scenes of railroads along the Mendocino Redwood Coast. Make arrangements through the front desk. 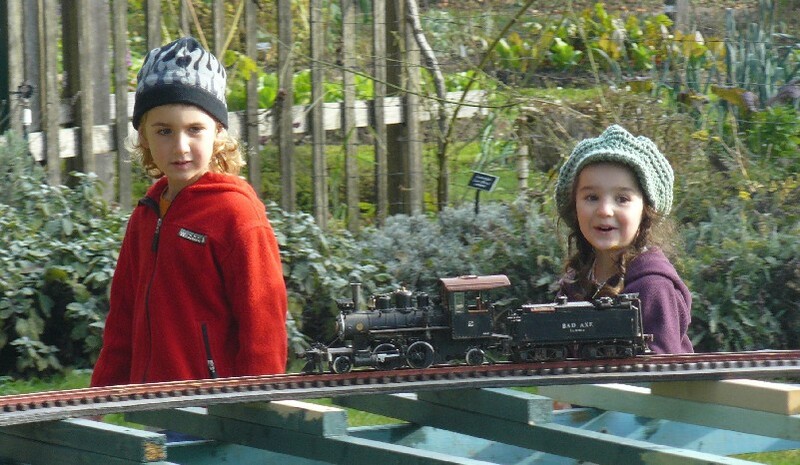 Located by the vegetable garden in the Mendocino Coast Botanical Gardens, the train is running daily until January 1 (except for Dec 25), then open weekends year round. The public is invited to attend a dedication ceremony on December 20 at 10 am as California State Parks proudly announces the installation of 11 new interpretive panels along the boardwalk at Laguna Point, part of MacKerricher State Park.The panels are designed to inspire and inform visitors about the natural and cultural history of Laguna Point and surrounding areas. These dynamic panels describe and depict a variety of topics including Native American traditions, logging history, harbor seals, gray whales and more. Also included along the boardwalk is an important display on how to stay safe on the shore. These are the newest and arguably the best interpretive panels that State Parks has anywhere on the Mendocino Coast, and we are very excited to share them with locals and visitors alike! Entrance to the park is free, so plan on bringing your families to enjoy a stroll and stop by Laguna Point at 10:00 am for the ceremony. MacKerricher State Park, 3 miles north of Fort Bragg, California, on Highway 1. To reach the dedication ceremony location, enter at the park’s main entrance, where you see the large wooden sign, and turn left at the second stop sign. Follow the park road past Lake Cleone and under the bridge to the Laguna Point Parking lot near the ocean. For more information on these exciting new panels or the dedication ceremony, please contact Park Interpreter Fred Andrews at (707) 961-0471. The Gloriana Carolers in the Sanctuary at the Mendocino Presbyterian ChurchFor over 20 years, the Gloriana Carolers (part of Gloriana Musical Theater Company) have been caroling in Victorian garb during the holidays. All of the money raised goes for scholarships for students in the performing arts (over $20,000 over the years!). Each year, the Carolers put on 2 community concerts — the concerts are free, but donations go to the scholarship fund. There are 2 caroling groups this year: an all-women group, and a mixed quartet (blog author DFF is a member). Both groups will be performing, and the concert ends with a sing-along. The first concert is Monday, December 15, from 8-9 pm at the Mendocino Presbyterian Church, 44831 Main St, Mendocino. The second concert is at the First Baptist Church, E. Pine and Franklin Streets, in Fort Bragg on Tuesday, December 16, from 8-9 pm. This weekend, take the opportunity to enjoy our small town uniqueness by attending one of these holiday events. Fun for all ages! Santa is coming town. Join us for caroling by Gloriana, followed by the tree lighting and Santa’s arrival on the fire truck. Gifts for the children and plenty of cookies for everyone. 707-937-5791. College of the Redwoods presents their winter concert. Free to the pubic. Soloists Elaine Miksak and Dan Fowler accompanied by Jack Leung on piano and his ensemble. Mendocino Presbyterian Church, Main Street.